We design, implement and accelerate operational and digital transformation through people. Realizing tomorrow's results, today. Founder Alexander "Alec" Proudfoot envisioned a better way to help companies achieve operational goals. His philosophy of developing human traits that contribute to a company's success stands the test of time and continues to be the driving force behind our business. We are proud of our reputation as the leading operations consulting firm and a client base comprising world-class, Fortune 500 companies that trust their transformations to Proudfoot. With a 70+ year legacy of client success to call upon, our combination of global reach and agile expert resources, Proudfoot is ever-focused on achieving sustainable improvement and client results through our core capability; People SolutionsTM. Today, Proudfoot is integrating new approaches and our unique know-how in operations transformation to provide innovative insights, proven solutions and lasting positive change for our clients. We know transformative change. We know transformation starts with aspiration and the journey to make it happen, is people - implementation. Proudfoot works with leaders at all levels, and their teams, in mid and large cap organizations, to solve the people challenge in the design and implementation of operational and digital transformation, and by doing so mitigate the risk associated with transformation and realize the benefits. Help people understand and gain alignment to their aspirations & the scope of their challenge. We enable people to participate; ‘stepping up and feeling all-in’ for the journey and so, gain speed and scale in implementing transformation. We roll up our sleeves and put on our safety boots (physically or metaphorically), to help implement the transformation. And, we help make it stick… until the organization needs to change again. Importantly, we focus on developing and building the capability of our client's people, so they can do it themselves, next time. 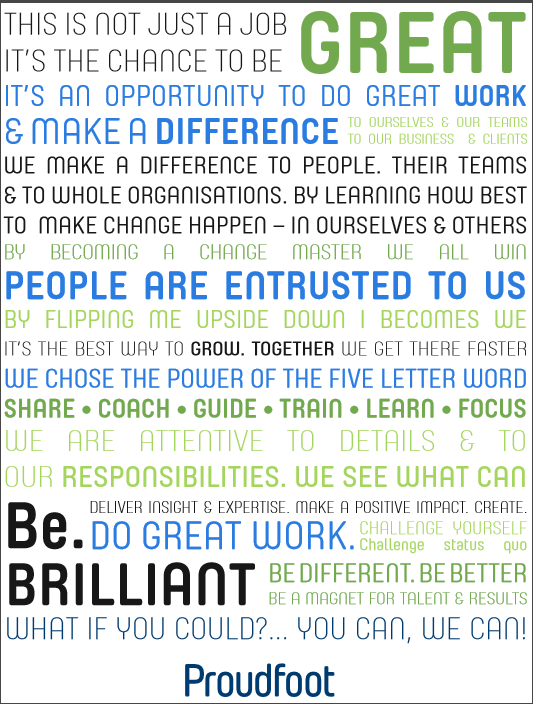 In short, we help people change the way they work to change their business for the better. We help them realize tomorrows results. What if you could? With Proudfoot, you can. What if you could bring your billion dollar capital project back on schedule? What if you could reclaim 200 hangar days a year to sell to other airlines? What if you could realize the expected return on your investment in IT? What if you could build transformation capability within your own teams ? What if you could reduce your operational risk while increasing production? What if you could take your product to marketing faster? What if you could ensure your ramp-up to production cycle in on time and safe? What if you could rapidly increase cash? These are just a few of the achievements Proudfoot brings to our clients to help them realize tomorrow's results, today. To our very core, we understand the human element of transformation. We introduce new capabilities, and we employ the power of your people to create performance multipliers and an engaged culture. Recognized for our speed and the magnitude of benefits we generate for our clients, we have been doing it — not just planning it — for more than 70 years.